George Donner was born in North Carolina in about 1785. He lived for a while in Kentucky before moving to Sangamon County, Illinois. Donner decided to move to California. 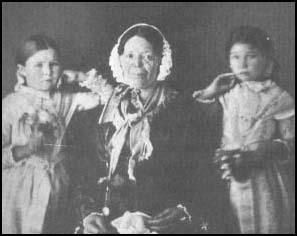 In April, 1846 Donner, his third wife (Tamsen) and their five daughters joined with a party led by James Reed. His brother, Jacob Donner, his wife Elizabeth, and their seven children also joined the party. The Reed-Donner wagon train, now made up of twenty vehicles and hundred people, arrived in Independence, Missouri, in May, 1846. The Donner-Reed wagon train left Independence, Missouri, for Sutter's Fort in May, 1846. Later that month, James Reed's mother-in-law died next to the Blue River in Kansas. She was to be the first of large number of people to die on this journey. The party followed the Oregon Trail until they reached Fort Bridger on 28th July. At the fort the party met Lansford Hastings. He was busy attempting to persuade Oregon-bound emigrants to go to California by way of what became known as the Hastings Cutoff. Hastings claimed that his route would remove 300 miles from the distance to Sutter's Fort. His cut-off involved crossing the Wasatch Mountains, round the Great Salt Lake to the south, then due west to the Humboldt River in Nevada, before returning to the main trail from Fort Hall. Hastings told people that the desert was only 40 miles across and that they would find water after 24 hours. It was in fact 82 miles wide and water was only to be found after 48 hours of travelling. Hastings told Donner and James Reed that three wagon trains had already opted for this route. The Donner Party had made poor time so far and was already some way behind most of the other wagon trains travelling from Independence to Sutter's Fort. They knew they had to cross the Sierra Nevada before the snowfalls that would their path to Sutter's Fort. This usually happened in early November. Although they were on schedule to reach the mountains by late summer they were worried about other delays that could mean being blocked by the winter weather. They therefore made the decision to take the advice of Lansford Hastings and take the proposed short-cut. On 31st July the Donner Party left Fort Bridger. They did not come out of the Echo Canyon until the 6th August. What they expected to take them four days had actually taken them seven days. They found a letter from Lansford Hastings advising them to camp at the Weber River and to send a man ahead to find him so he could show them a new route to California. James Reed and Charles T. Stanton went off in pursuit of Hastings. When they found him he refused the offer of becoming the personal guide to the Donner wagon train. Instead he drew a rough map of the new route. The Donner Party entered the Wasatch Mountains on 12th August. They soon discovered they had to chop their way through aspen, cottonwood and tangled undergrowth to make a route for the wagons. Over the next few days they had to dislodge boulders and build causeways across swamps in order to reach the valley of the Great Salt Lake. The twenty-three wagons of the Donner Party was now joined by the Graves family and their three wagons. As Virginia Reed later recorded the new group consisted "Franklin Graves, his wife and eight children, his son-in-law Jay Fosdick, and a young man by the name of John Snyder." It was now the 27th August and they still had to cross the Salt Desert. Members of the party now realised they were in serious trouble and now had only a small chance of crossing the Sierra Nevada mountains before the winter snows blocked their route. The faster wagons pushed on ahead and the slow, heavily laden wagons of the Reeds and Donners were by now falling further and further behind. The Donner Party reached Pilot Peak on 8th September. To enable them to keep up, the Reeds and Donners had to abandon some of the heavy goods they were carrying. They also abandoned three wagons and increased the number of oxen pulling the remaining wagons. Members of the party were also having doubts about whether they had enough food to last them before they reached California. It was therefore decided to send two men, Charles T. Stanton and William McCutcheon ahead to Sutter's Fort in order to purchase provisions for the wagon train. The Donner Party now started out towards the Humboldt River. On the 30th September they reached the main trail from Fort Hall to Sutter's Fort. However, by this time the rest of the 1846 wagon trains had long gone and were already in California. The Donner Party now had trouble from the Paiute. They stole two oxen and two horses. They also fired several arrows at the wagon train and wounded some of the animals. On 5th October, 1846, another disaster struck the Donner Party. James Reed and John Snyder had an argument about one of the wagons. Snyder lost his temper and hit him over the head with a bullwhip. Reed drew his knife and stuck it into Snyder's body. Snyder mumbled: "Uncle Patrick, I am dead." His prediction was correct and Lewis Keseberg immediately began to set up a wagon tongue as a makeshift gallows. William Eddy used his gun to insist that Reed would not be lynched. The others agreed and after much discussion it was decided that Reed should be banished from the wagon train. He was forced to make his way to Sutter's Fort on horseback without weapons. To many in the party this was equivalent to sentencing Reed to death. Soon afterwards Lewis Keseberg ejected one of his employees, Hardkoop, from his wagon. He was never seen again and it is not known whether he died of starvation or was killed by local Native American tribes. This was followed by the disappearance of another German named Wolfinger. Joseph Reinhardt and Augustus Spitzer later confessed they had robbed and murdered Wolfinger. The Donner Party now had to cross a 40 mile desert. Over the next three days the wagon train suffered repeated attacks from groups of warriors. During this time they stole 18 oxen, killed another 21 and wounded many others. Since most of their animals were now dead or stolen, the party was forced to abandon their wagons. The party reached the Truckee Lake at the end of October. On 19th October Charles T. Stanton arrived back from Sutter's Fort with seven mules loaded with food. William McCutcheon had been taken ill and had been forced to stay at the fort. However, Stanton had brought back with him two Indian guides to help them get to California. Stanton also brought news that James Reed had successfully reached California. On 20th October William Foster killed his brother-in-law in a shooting accident. The Donner Party now began its attempt to cross the the Sierra Nevada mountains. A few snow flurries made them realise they were in a desperate race for time. In the distance they could see that the peaks were covered in snow. On 25th October a Paiute warrior opened fire on what was left of the animals. He hit nineteen oxen before being killed by William Eddy. The migrants ploughed on but when they got to within three miles of the summit they found their way blocked by five-foot snowdrifts. They were now forced to turn back and seek cover in a cabin they had passed at the foot of the mountain. Meanwhile James Reed and William McCutcheon had set out with enough food to keep the Donner Party alive for the winter. However, they had found their path blocked and had to return with their pack mules to Sutter's Fort. The surviving members of the wagon train now set about constructing a camp next to what later became known as Donner Lake. Patrick Dolan, Patrick Breen and his family moved into the abandoned cabin whereas Lewis Keseberg built a lean-to against one of the walls. William Eddy and William Foster built a log cabin. So also did Charles T. Stanton. His cabin was to house the Graves family and Margaret Reed and her children. Donner managed to construct a primitive shelter for his family. The Donner Party was desperately short of food. The remaining animals were killed and eaten. Attempts to catch fish in the river was unsuccessful. Some of the men went hunting but during the next two weeks they were only able to kill one bear, a coyote, an owl and a grey squirrel. It was clear that if they stayed in the camp they would all die of starvation and on 12th November thirteen men and two women made another attempt to get to Sutter's Fort. However, they found their way blocked by a 10 foot snow drift and returned to camp. The party rested for a few days and then a party led by William Eddy and Charles T. Stanton made another attempt to reach safety. On 21st November they returned to camp defeated. Soon afterwards Baylis Williams died. This motivated the stronger members of the party to make one last attempt to cross the mountains. On 16th December fifteen members of the party left the camp and headed for the summit. This became known as the Forlorn Hope group. Aided by better weather, this time they managed to cross the mountain pass. On 20th December they had reached a place called Yuba Bottoms. The following morning Stanton was not strong enough to leave the camp. The rest were forced to leave him to die. William Eddy now took responsibility for leading the group to safety. On 24th December they were out of food and too weak to go on. The group came to the decision that the only way they could survive was to resort to cannibalism. That night Billy Graves and a Mexican called Antoine died. The following day Patrick Dolan also passed away and on 26th December they began cooking Dolan's arms and legs. At first only three members of the party, Eddy and the two Indian guides, refused to eat the meat. However, over the next two days they succumbed to temptation and resorted to cannibalism. They now had a fourth body to consume as Lemeul Murphy died that night. On 30th December the party, much stronger after their cannibal feast, set off again. However, the weather deteriorated and they were once again forced to halt and make a camp. Out of food, the group began talking about murdering Luis and Salvador, the two Indian guides. Eddy argued against this idea and he secretly told Luis and Salvador that they were likely to be murdered if they remained. That night, while the others slept, they left the camp. William Eddy and Mary Graves now volunteered to go out hunting. Eddy managed to kill a deer but by the time they got back to the camp Jay Fosdick had died. This supplied more meat for the six remaining members of the group. The next day the party found the dying bodies of Luis and Salvador. Eddy was unable to stop William Foster killing the two Indians. This created conflict between Eddy and Foster and it was decided that they could no longer work together. The group now split up: Foster, his wife and sister, Harriet Pike made up one party whereas Eddy travelled with Mary Graves, Sarah Fosdick and Amanda McCutcheon. On 12th January, Eddy's group reached a Paiute village. They took pity on the travellers and gave them a corn meal. This gave them the strength to move on and five days later found another village. This time they were given a meal of pine nuts. Eddy then paid a warrior a pouch of tobacco to act as a guide to Sutter's Fort. This he agreed to do and after a further six mile walker, Eddy reached his destination. When he heard the news James Reed quickly organized a relief party to go back and find the rest of the Forlorn Hope group. Johann Sutter and Captain Edward Kern, the commanding officer at Sutter's Fort, offered to pay $3 a day for anyone willing to form a relief party to rescue those still camped at Donner Lake. Only seven men agreed to accept this dangerous task and on 31st January the small team led by Daniel Tucker left the fort. James Reed successfully brought back William Foster, Sarah Foster, Harriet Pike, Mary Graves, Sarah Fosdick and Amanda McCutcheon. He now began preparing a second relief party. He organized a public meeting where he raised $1,300. He used this money to buy supplies and to hire six more men. William Eddy also agreed to guide the team back to the Donner Lake and they departed on 7th February. Several members of Tucker's party threatened to turn back reached Bear Valley where the snow was ten feet deep. Tucker was forced to pay the men $5 a day to anyone who completed the journey. On 18th February they managed to reach Donner Lake. The first person they came across asked: "Are you men from California, or do you come from heaven?" They discovered that a large number had died. This included George Donner who had died on 13th March, 1847. His wife, Tamsen Donner died two weeks later. However, his daughters, Elitha, Leanna, Frances, Georgia and Eliza all survived this tragedy. 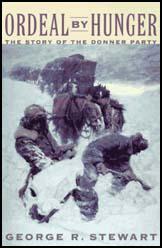 The Donner Party was the worst disaster in wagon train history. Forty-two emigrants and two Indian guides had died. However, the remaining forty-seven travellers survived. It is supposed there be 7,000 waggons start from this place, this season We go to California, to the bay of Francisco. It is a four months trip. We have three waggons furnished with food & clothing, etc. drawn by three yoke of oxen each. We take cows along & milk them & have some butter though not as much as we would like. I am willing to go & have no doubt it will be an advantage to our children & to us. Our journey, so far, has been pleasant... Our route at first was rough and through a timbered country which appeared to be fertile. After striking the prairie we found a first rate road, and the only difficulty we had has been crossing creeks... The prairie between the Blue and the Platte rivers is beautiful beyond description. Never have I seen so varied a country - so suitable for cultivation. Every thing was new and pleasing. We are now on the Platte, 200 miles from Fort Laramie... Wood is now very scarce, but "Buffalo chips" are excellent - they kindle quick and retain heat surprisingly. We had this evening Buffalo steaks broiled upon them that had the same flavor they would have had upon hickory coals. We feel no fear of Indians. Our cattle graze quietly around our encampment unmolested. Two or three men will go hunting twenty miles from camp - and last night two of our men lay out in the wilderness rather than ride their horses after a hard chase. Indeed if I do not experience something far worse than I have yet done, I shall say the trouble is all in getting started. We arrived here (Fort Laramie) yesterday without meeting any serious accident. Our company are in good health. Our road has been through a sandy country, but we have as yet had plenty of grass for our cattle and water.... Two hundred and six lodges of Sioux are expected at the Fort today on the way to join the warriors on the war against the Crows. The Indians all speak friendly to us. Two braves breakfasted with us. Their ornaments were tastefully arranged, consisting of beads, feathers, and a fine shell that is got from California, bark variously colored and arranged, and the hair from the scalps they have taken in battle... Our provisions are in good order, and we feel satisfied with our preparations for the trip. We have arrived here safe with the loss of two yoke of my best oxen. They were poisoned by drinking water in a little creek called Dry Sandy, situated between the Green Spring in the Pass of the Mountains, and Little Sandy. The water was standing in puddles. Jacob Donner also lost two yoke, and George Donner a yoke and half, all supposed from the same cause. I have replenished my stock by purchasing from Messrs. Vasques & Bridger, two very excellent and accommodating gentlemen, who are the proprietors of this trading post. The new road, or Hastings' Cut-off, leaves the Fort Hall road here, and is said to be a saving of 350 or 400 miles in going to California, and a better route. There is, however, or thought to be, one stretch of 40 miles without water; but Hastings and his party, are out ahead examining for water, or for a route to avoid this stretch. I think that they cannot avoid it, for it crosses an arm of the Eutaw Lake, now dry. Mr. Bridger, and other gentlemen here, who have trapped that country, say that the Lake has receded from the tract of country in question. There is plenty of grass which we can cut and put into the waggons, for our cattle while crossing it. We are now only 100 miles from the Great Salt Lake by the new route, in all 250 miles from California; while by way of Fort Hall it is 650 or 700 miles - making a great saving in favor of jaded oxen and dust. On the new route we will not have dust, as there are about 60 waggons ahead of us. The rest of the Californians went the long route - feeling afraid of Hasting's Cutoff Mr. Bridger informs me that the route we design to take, is a fine level road, with plenty of water and grass, with the exception before stated. It is estimated that 700 miles will take us to Captain Sutter's Fort, which we hope to make in seven weeks from this day. Then came a long, dreary pull over a low range of hills, which brought us to another beautiful valley where the pasturage was abundant, and more wells marked the site of good camping grounds. Close by the largest well stood a rueful spectacle - a bewildering guide board, flecked with bits of white paper, showing that the notice or message which had recently been pasted and tacked thereon had since been stripped off in irregular bits. In surprise and consternations, the emigrants gazed at its blank face, then toward the dreary white beyond. Presently, my mother knelt before it and began searching for fragments of paper, which she believed crows had wantonly pecked off and dropped to the ground. Spurred by her zeal, others also were soon on their knees, scratching among the grasses and sifting the loose soil through their fingers. What they found, they brought to her, and after the search ended she took the guide board, laid it across her lap, and thoughtfully began fitting the ragged edges of paper together and matching the scraps to marks on the board. The tedious process was watched with spellbound interest by the anxious group around her. On the morning (12th October, 1846) George Donner, Jacob Donner, and Wolfinger lost eighteen head of cattle. Graves, also, had a cow stolen by Indians. They encamped on the night ... on a small spot of very poor grass. The water here, also, was deficient in quantity and bad in quality. Breen had a fine mare die in the mud. He asked Mr. Eddy to help him get her out. Mr. Eddy referred him to poor Hardcoop, and refused. Several cattle had arrows shot at them during the night, but none of them died in consequence. A number of the relief party remained here, while Messrs. Miller, McCutchen, and one of the men and myself, proceeded to the camp of the Messrs. Donner's. This was a number of miles further east. We found Mrs. Jacob Donner in a very feeble condition. Her husband had died early in the winter. We removed the tent and placed it in a more comfortable situation. I then visited the tent of Geo. Donner, close by, and found him and his wife. He was helpless. Their children and two of Jacob's had come out with the party we met at the head of Bear valley. I requested Mrs. George Donner to come out with us, as I would leave a man to take care of both Mr. George Donner and Mrs. Jacob Donner. Mrs. Geo. Donner positively refused, saying that as her children were all out she would not leave her husband in the situation he was in. After repeatedly urging her to come out, and she as positively refusing, I was satisfied in my own mind that Mrs. Geo. Donner remained with her husband for pure love and affection, and not for money, as stated by Mrs. Curtis. When I found that Mrs. Geo. Donner would not leave her husband, we took the three remaining children of Jacob Donner's leaving a man to take care of the two camps. Leaving all the provisions we could spare, and expecting the party from Sutter's fort would be in in a few days, we returned to the camp of Mrs. Graves, where all remained during the night except McCutchen, Miller, and myself, we going to the cabin of Mr. Breen, where two of my children were. Notice was given in all the camps that we would Start on Our Return To Sutter's early the next day." Mother says: Never shall I forget the day when my sister Elitha and myself left our tent. Elitha was strong and in good health, while I was so poor and emaciated that I could scarcely walk. All we took with us were the clothes on our backs and one thin blanket, fastened with a string around our necks, answering the purpose of a shawl in the daytime, and which was all we had to cover us at night. We started early in the morning, and many a good cry I had before we reached the cabins, a distance of about eight miles. Many a time I sat down in the snow to die, and would have perished there if my sister had not urged me on, saying, 'The cabins are just over the hill.' Passing over the hill, and not seeing the cabins, I would give up, again sit down and have another cry, but my sister continued to help and encourage me until I saw the smoke rising from the cabins; then I took courage, and moved along as fast as I could. When we reached the Graves cabin it was all I could do to step down in the snow-steps into the cabin. Such pain and misery as I endured that day is beyond description. Messrs. Eddy, Foster, Thompson, and Miller, started at about 4 o'clock, on the following morning, for the Mountain Camp, where they arrived at about 10 o'clock, a.m. A more shocking picture of distress and misfortune, can not be imagined, than the scene they witnessed upon their arrival. Many of those who had been detained by the snows had starved to death. Their bodies had been devoured by the wretched survivors; and their bones were lying in and around the camps. ... Something was absolutely necessary to be done to sustain their miserable existence; yet all of them, except Keseburg, had refrained from this most monstrous food as long as any thing else could be had. ... This man also devoured Mr. Eddy's child, ... and was among the first to communicate the fact to him. ... Such was the horrible and emaciated appearance of this man that Mr. Eddy, as he informed me, could not shed his blood there; but he resolved to kill him upon his landing at San Francisco, if he ever came to the place. The party of Messrs. Eddy and Foster, upon their arrival at the Mountain Camp, found five living children, to wit: three of George Donner's, one of Jacob Donner's, and one of Mrs. Murphy's. They also found a man whose name is Clarke. ... Clarke had gone out with Mr. Reed, I believe, under the pretense of assisting the emigrants. He was found with a pack of goods upon his back, weighing about forty pounds, and also two guns, about to set off with his booty. This man actually carried away this property, which weighed more than did a child he left behind to perish. ... In addition to these, there were in camp, Mrs. Murphy, Mr. and Mrs. George Donner, and Keseburg - the latter, it was believed, having far more strength to travel, for the reason, as was suspected, that he wished to remain behind for the purpose of obtaining the property and money of the dead. Mrs. George Donner was in good health, was somewhat corpulent, and certainly able to travel. But her husband was in a helpless condition, and she would not consent to leave him while he survived. She expressed her solemn and unalterable purpose, which no danger and peril could change, to remain, and perform for him the last sad offices of duty and affection. She manifested, however, the greatest solicitude for her children; and informed Mr. Eddy that she had fifteen hundred dollars in silver, all of which she would give to him, if he would save the lives of her children. He informed her that he would not carry out one hundred dollars for all that she had, but that he would save the children, or perish in the effort. The party had no provisions to leave for the sustenance of these unhappy and unfortunate beings. After remaining about two hours, Mr. Eddy informed Mrs. Donner that he was constrained by the force of circumstances to depart. ... The parting scene between the parents and children is represented as being one that will never be forgotten, ... and that the last words uttered by Mrs. Donner, in tears and sobs, to Mr. Eddy, were, 'O, save! save my children!' Mr. Eddy carried Georgiana Donner, who was about six years old; Hiram Miller carried Eliza Donner, about four years old; Mr. Thompson carried Frances Ann Donner, about eight years old; William Foster carried Simon Murphy, eight years old; and Clarke carried his booty, and left a child of the Donners to perish. This morning Foster, Rhodes, and J. Foster started with small packs for the first cabins intending from thence to follow the trail of the person that had left the morning previous. The other three remained behind to cache and secure the goods necessarily left there. Knowing the Donners had a considerable sum of money, we searched diligently but were unsuccessful. The party for the cabins were unable to keep the trail of the mysterious personage owing to the rapid melting of the snow, they therefore went direct for the cabins, and upon entering discovered Keseberg lying down amidst the human bones and beside him a large pan full of fresh liver and lights. They asked him what had become of his companions, whether they were alive, and what had become of Mrs. Donner. He answered them by stating they were all dead; Mrs. Donner, he said, had in attempting to cross form one cabin to another, missed the trail, and slept out one night; that she came to his camp the next night very much fatigued, he made her a cup of coffee, placed her in bed and rolled her well in the blankets, but the next morning found her dead; he eat her body and found her flesh the best he had ever tasted! He further stated that he obtained from her body at least four pounds of fat! No traces of her person could be found, nor the body of Mrs. Murphy either. When the last company left the camp, three weeks previous, Mrs Donner was in perfect health though unwilling to come out and leaver her husband there, and offered $500 to any person or persons who could come out and bring them in, saying this in the presence of Kiesburg, and she had plenty of tea and coffee, we suspected that it was her who had taken the piece from the shoulder of beef in the chair before mentioned. In the cabin with Keseberg was found two kettles of human blood, in all supposed to be over one gallon Rhodes asked him where he had got the blood, he answered, "there is blood in dead bodies,"--they asked him numerous questions, but he appeared embarrassed and equivocated a great deal, and in reply to their asking him where Mrs. Donner's money was, he evinced confusion and answered, that he knew nothing about it. That she must have cached it before she died: "I haven't it" said he, "nor the money, nor the property of any person, living or dead!" They then examined his bundle and found silks and jewelry, which had been taken from the camp of the Donners, and amounting in value to about $200; on his person they discovered a brace of pistols, recognized to be those of George Donner, and while taking them from him discovered something concealed in his waistcoat, which on being opened was found to be $225 in gold. Before leaving the settlements, the wife of Kesebrrg had told us that we would find but little money about him; the men therefore said to him that they knew he was lying to them, and he was well aware of the place of concealment of the Donner's money; he declared before heaven, he knew nothing concerning it, and that he had not the property of any one in his possession; they told him that to lie to them would effect nothing, that there were others back at the cabins, who unless informed of the spot where the treasure was hidden, would not hesitate to hang him upon the first tree. Their threats were of no avail, he still affirmed his ignorance and innocence, and Rhodes took him aside and talked to him kindly, telling him that if he would give the information desired, he should receive from their hands the best of treatment, and be in every way assisted, otherwise, the party back at Donners' camp, would, upon his arrival and refusal to discover to them the place where he had deposited this money, immediately put him to death; it was all to no purpose, however, and they prepared to return to us, leaving him in charge of his packs, and assuring him of their determination to visit him in the morning, and he must make up his mind during the night. They then started back and joined us at Donner's Camp.